In What Did One Elephant Say to the Other? we explore animal communication. How do people communicate? We speak and we write. Well, animals can't do these things, so how do they communicate? Answer: they communicate with their body language and the sounds that they make. 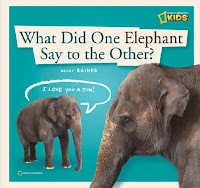 This book looks particularly at elephants and the different ways they use their body to talk to each other. 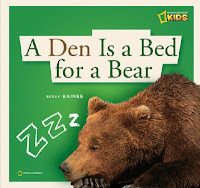 A Den is a Bed for a Bear looks at all different kinds of bears and the homes in which they live. It explains that bears bulk up by eating lots of food before finding a den in which to hibernate. It shows baby bears getting bigger, growing strong inside the warm den. Skin is like a suit of armor. Skin can tell where you've been. Your brain and heart do their part. But it's your skin that holds you in! These basic facts are accompanied by smaller captions that give more information and each page includes colorful photos and playful drawings to illustrate the concepts. The small size of these books make them perfect for little hands. Besides the three I've mentioned here, there are more books in the series: Every Planet Has a Place, The Bones You Own, What's in That Egg?, What Does a Seed Need? (coming in September 2009), and An Artist Named Spider (coming in September 2009). I'm hopeful that there will be many more! 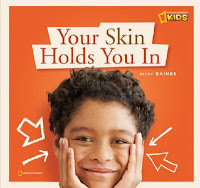 If you're looking for great nonfiction for preschoolers, check these out! Happy Nonfiction Monday! The round up's over at the ACPL Mock Sibert blog!